no prob man. i also just added 2 more. omg ...this is a gold mine of layouts. Building the Hiwatt as soon as I log off, will report back with results! awesome. hopefully it fires right up. i went through the layouts a few times and didn't spot anything glaring, so i'm fairly confident. plus if you verify it then we hit 1000 verified layouts. Hey Zach, any idea what A+ voltage is on these? I think I'd rather use a transformer if possible as opposed to the charge pump/daughterboard, thx. it's written in the schematic in the link above. the pump is there to give you +12V DC and -12V DC it's not increasing the voltage, so need to use a +12V DC power adapter. if you want to go the route of making using a transformer than you'll need to make a separate board to match the power section in the schematic. Ahh, I see so it's a 12v+/12v- dual supply. Any advice on the best method to get split rails out of a single trans using common parts? I noticed the original pedal uses a trans so I assume it can be done. Looked into a resistor divider but it appears this goes to heck once any load is connected so not sure how to properly go about this ...thanks! Disregard my request, I found Bajaman's schematic on La Revolution and it spells out exactly how to build the supply using a 12v AC transformer. again, if you look at the schematic in the link posted at the top you'll see how to setup a transformer and will have to make a layout for it. it's much easier to use a +12V DC power supply, and it will allow you to put the circuit in a 1590BB without the need for a bigger enclosure like the original one. Ok, finally got the message, thanks for the heads up my friend. It just amazes me how u can do so many layouts. I can't even layout a little vero lol. Thanks for all the work u do. Jack. no prob man, and thanks. really it's not that big a deal for these since the front half is all the same, all i had to do was change values in the tonestack, or in the case of the ones that have bandaxall tone stack (orange, matamp, and ampeg) i just had to do some moving around components. i've got a few layouts i want to get done that are a much more complicated than these. those take a lot more time. Hi, great work but AFAIK Marshall's tonestack is after a tube buffer while Fender(& Hiwatt) doesn't have a buffer before the tonestack, did you altered the circuit considering this? There's no buffer in any of the layouts posted. In all the layouts the tonestack comes after the tube gain stage, particularly they all come off pin 1 of the tube. The original had a FET input and output buffer, but I have removed them. Is there a way to make the charge pump run on 9VDC? The heater wants to see that 12V to function properly. They could work as a preamp? Could be used with a power amp? there's a bunch of different ways you can do it. take a look at the thread johnk started when he posted his layout for it. you can also see how a zosotone, and Freppo did theirs. i'm planning on doing it similar to Freppo, but instead of just having the tube hanging out like that i ordered a few tube cages. Thank you sir - very enlightening. I'm keen to have the tube inside the enclosure (I'm pretty clumsy) so I reckon I'll try zosotone's approach, that's darned clever. Then pardon my ignorance, what happens if I power it up with a 9VDC to 12VDC charge pump? Or any charge pump for that matter. I've done it like freppo but I used a socket with a removable shield (like on Fender amps). This is the easy way to do it, but if you were to step on the shield you'd probably destroy the socket and tube. This is INSANELY COOL! Thanks Zach! You can't use a 1044 with this. The maximum input voltage of the 1044 is 9.5V, this circuit needs a 12V supply. Mouser has them (not cheap though). Although. You could simply go with ICL7660S, but then i'd strongly suggest taking a 100R resistor and 12V zener to ground from the pins 1&8. 7660S will burn instantly if it gets more than 12V to its input. Oh. Those 1054s are available from china through ebay as well. One should, however, take note that chinese sell a lot of out-of-specs / counterfeit stuff through ebay. Not saying that this particular seller is doing it, but the possibility exists. no offense, but I hope you never graduate! ;) Love these study break layout avalanches.. keep up the fantastic work Zach! Haha. Thanks man. Well trust me, I'll still be posting layouts when I'm done. The one thing that will change is I'll have more build time for myself. The only builds I've had time for is customer builds. Any chance of adding a dumble style tone stack? shouldn't be an issue. i'll look to find a dumble amp schematic to lift the tonestack from. 2 dumble tonestack layouts added. surprised it wasn't as easy as i had hoped, but should be good. Hey, probably a stupid question but can I run this before other pedals or a solid state practice amp safely? Why wouldn't? Theoretically it should give you a tubey overdrive. As far as how it will sound, won't know until you try it. Could sound great could sound terrible. Thanks! I'm going to give one of these ago next week hopefully - I'll let you know how it sounds. Going to be a while before I can build but will definitely do and report back when complete. Great Layouts Zach! I was wondering how it sounds with a little solid state Poweramp and higher voltages at the plate of the 12ax7. Do you think there is a need for changing some values. I have some old transformers for dual powersupplys and that would be a nice oppertunity to do something with one of them. Has anyone verified the "Dumble Overdrive Special 70's" version? Does the Treble 3 connect to both the switch and hi pot, lug 3? yes they connect to both, which i why i showed the wiring on the switches. Also...the layout says that mids 2 and 3 and volume 1 connect from the board...but below that it says that mid's 3 connects there as well...Is this correct? ignore the note about low 1 connecting to mids 3, it's left over from a previous version. One connection says "Mids 2 & 3, Volume 1" and the next one down says "Mids 3". Can you clarify when you get a chance? I built it, but when I connect the tube, the voltage drops from +12 / -12 down to around a volt (and my LED turns off), so I want to be sure I have the wiring correct to check that off my troubleshooting list. i'm not sure which layout you're talking about now. i took a look at both dumble layouts, and i think you're talking about the 70's dumble. if so there are is a typo that has been corrected. the wire that said "Mids 2 & 3, Volume 1" sound be "Mids 1 & 2, Volume 1." as for as the voltage dropping issue that mistake with the pot wiring shouldn't cause that. i believe there's build error or an issue with your power supply. post some pictures and a description of the issue in the debugging section of the forum. Thanks zach. It is the 70's dumble. I found a backwards cap and missing resistor...still having issue though. Lesson learned...don't drink and solder. Should these questions be posted here or in the forum? I'll keep digging...thanks for your awesome work! I'm building three of these (two Vox versions and one Sunn version, all for a ridiculous three-channel Leslie-emulator amp I'm building, but that's another story). The various schematics I've found all show one of the 10k resistors (in the Vox tagboard version, the one between the 100k and 68k resistors) going to A-. However, in the Vox mod on this page, that resistor goes to ground rather than A-. In the Sunn version, the 10k resistor goes to neither ground nor to A-. In each of these cases, is this correct? I ask because none of my three builds are working (they have below unity output and the drive pot is decidedly non-linear). Oop. You're right. The 10k resistor should go to A- must have missed that when I was moving stuff around and changing the layouts for the different tonestacks. I'll make the change later today. Good catch. Try moving the resistor to A- and see if that fixes the issue. went back over the schematic due to some errors brought up. made the corrections and updated all the layouts. I rebuilt the Sunn version using the edited schematic. There are still some issues. It looks like "Mids 2" needs to be moved up one row. And there's some general weirdness with the cuts and jumpers to the south of the IC. The A- row should extend all the way across the board, I think, rather than getting interrupted by that cut below the IC. Those changes got me closer, but I'm still missing something. you're right about the mids 2 wire, but A- does not go all the way across, the cut should be there. take the 47uF cap that has the negative side on pin6 and move that leg to pin 5. that's the issue along with the IC being a 7660s instead of LT1054 makes the power section correct. see if that brings it to life. if not there has to be an error in the main layout and i'll have to go through it all again checking to see what's off with the main board. Thanks, Zach, for all your help with troubleshooting these boogers. Regarding that A- row, Shouldn't the 10K resistor, the one that's part of what appears to be a voltage divider coming off the 100k resistor, terminate at A-? It seems like the cut in question prevents that termination. ah, i miss understood what cut you were talking about, thought you were talking about the cut under the IC that would conenct pin 4 & 5. yes that cut is a leftover and shouldn't be there. make a connection on the copper side of the board to jumper the cut and see if that fixes the issue. 1,Volume 1 goes to ground, not to mids 1. The only thing that I'm still having problems with is the Gain pot, which has a tiny sweet spot and then goes silent to either side. I suppose this is a good time for me to learn what's going on in those opamps and then nail this sucker down. Hey man a couple of quick comments after looking over the board again and what you've done so far. 4. The cut you made next to the 2.2uF are you talking about in between the 2.2k resistor & 2.2uF cap? Cause those need to be connected where they are and there's a cut to the right of the 2.2uF so adding another one isn't going to do anything. 5. Did you try swapping out the gain pot? It's in the right location, so either it's bad or theres something else going on still. In comparing the layout to the schematic (in this case, Rev B, 11/21/91), the gain pot weirdness was a consequence of the 22K resistor going to A- rather than ground. 1. Add a cut immediately to the west of the south lead of the 2.2uf cap that you’ll find to the east of the IC and to the west of the 1.5k resistor. Without this cut, the signal is erroneously diverged into the tone stack. 2. Mids 1 & Volume 1 both go to ground so you can link them together and connect them right below lows 2&3/ high 1 (20,6). 6. And lugs 2&3 of the Drive pot should be connected, as opposed to 1&2. Good catch on the misplaced resistor and catching the issues. The cut you're talking about I see now, typically we talk identIfy spots by what column and row, like you ended up doing. I'll update the layout tomorrow night. 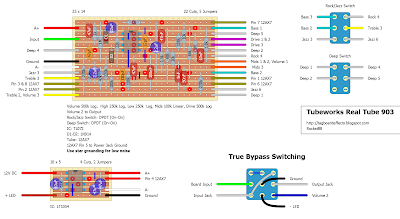 Btw, connecting mids 1 & volume 1 to the board won't increase noise, since all grounds are connected, so never be worried about connecting a ground to the board. Btw, how does it sound with the model t tonestack? Okie dokie. The Sunn version (with the above tweaks) sounds great. There's some hiss, but it's well within tolerance. To my ears, the tonestack has very distinct bass, mids and treble ranges, with bass and treble skewing more toward the bass and treble ends of the spectrum, respectively, than your typical marshall/fender set up. The power supply using the 7660S chip is meeting all power needs. 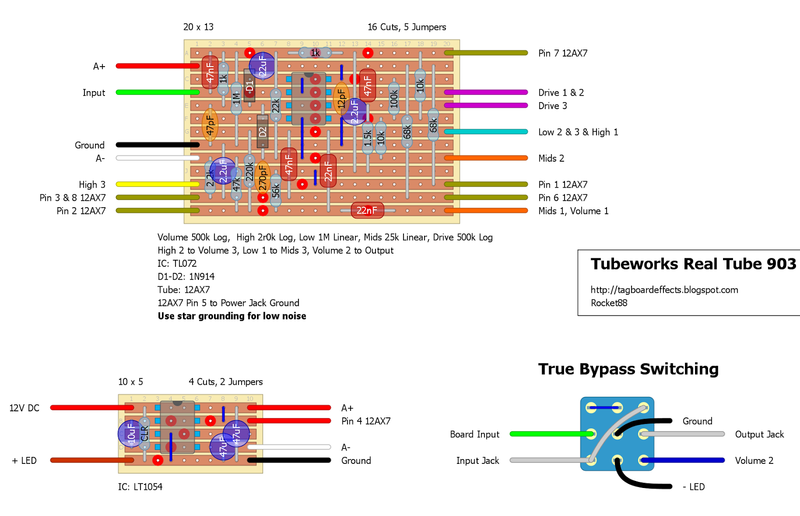 That's great news, most likely the other layouts with the FMV style tonestack are good to go too, so the big question is the dumble, and Bandax style tonestack circuits. Out of curiosity did you do a star ground? That might take away some of the little extra hiss. Hey, I tried building the Fender version today, not realising the schematic had been updated. I haven't made the changes yet but I noticed I was having a similar issue to others on the 901 thread, and as the tube warms up the led gets dimmer and dimmer, before eventually just switching off. Is this likely to be an issue that would be fixed by the revisions? In the other thread I noticed you were suggesting 7660s', should I try that instead? yes. i haven't changed that to the layouts because i have to do it to like 15 different ones. so before i do i want to make sure that's the culprit. I keep blowing the 47uf cap at the chargepump between A+ and the ground, its rated for 35v. Anyone has an idea why? Is your cap reversed? Negative marked lead needs to go to ground - if not, then your symptom is expected. So the negative lead of that cap is to ground. Then check the voltages and the pump. Only way to blow a filter cap is to feed it voltage in reverse. Hi, i've built dumble 70's and didnt work. I found that jazz 6 connect to nothing. Is that correct? Jazz 6 is not connected to anything. This wil probably take the 330pf from treble 3 and leave it out of the circuit. That would be my guess. It shouldn't be the reason why you're 70's dumble doesn't work. In the meantime, is the pedal working now? Or are you still searching for an error in the circuit? I've built the dumble 70's as well with the same result..did not work. I also built the standard 903 and can't get it to work. I have checked and double checked everything and I can't get any sound to pass through the tube. Any ideas anyone? For those of you having trouble with the Dumble layouts, here's a possible solution: Try moving the negative side of the 22K resistor to the ground row, not the A- row. 1. The 1k on top of the layout, going into the 2.2uf. The schematic says 22uf and a 1m to ground. Does it have any effect that the 1m is removed and the cap is smaller? 2. the 47nf after IC pin 7, it first goes into a 100k and then into 2 10k's. But why the 100k? Is this to reduce noise? 3. the 22k from A- going to 22uf/1k after IC pin 1. I can't see it in the schematic. 4. Tube pin 8 and 3. Going into a 2k2 to A-. But does it make contact with Tube pin 7 and 2 via any 10k? Or is this not needed? 5. the 2 68k's on Tube Pin 1 and 6. Schematic shows 6.8k but layout uses 68k. Is this because there's different voltages in the pedal? I just got the Vox version working. My only change to the layout was to move the negative leg of the 22K resistor to Ground rather than A-. At first, I couldn't get the tube to function, but then I tested my voltages on A- and A+ coming from the power supply. A- was at -12V and A+ was at 11.88V. I know virtually nothing about tube biasing, and I know even less about dual power supplies. Still, I figured that, in order for the ol' electrons to move the right way thru the tube, I ought to get the A- lower than the A+. I wired a 5K trimpot on A- coming out of the power supply and fiddled with it until, ahoy, the thing started working. I build the 90's Dumble and fiddled around with it. But with no luck. Same problems as some people already reported. LT1054 burns up right away and the 7660 only gives a oscillation noise. I socketed some stuff, so i could check some areas. like what Kevinrontel wrote and myself, but it didn't work. Still only oscillation. Hi guys! I built the ‘72 SVT version with no luck. I have the same result, the lt1054 burns up right away, I changed the supply to work with a 7660s and it seems to be working somehow, but it’s still not good. The tube glows as it should and signal passes through it but the low control cuts the signal when it’s maxed, and the drive works in reverse, the high and volume controls doesn’t do nothing (maybe the volume cuts the signal too) and it has really really low volume, it’s just slightly noticeable that the thing is on. I can’t imagine why does it burn the LT’ s, because I tried them in another pedal before installing and they worked fine. I built the Sunn version have same problems as Zoltan.I started back probing it with my audio probe.the problem i have is comming out of pin 1.I have clean signal going into pin 3 but pin 1&2 are hardly passing any audio.It sounds like a Jfet that is misbiased. Hello, in all Layouts there's a resistor in the power supply section with "CLR" on it. Which would be the right value? Thank you! Please anyone can you verify if this works?